Factropolis -- A Fun Fact Every Day! 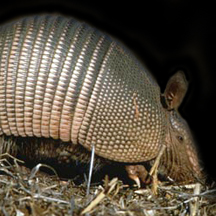 : In 2004, a lab at a university in Texas received a $6 million federal grant to breed radioactive armadillos for possible use in warfare. Ooooh! you're in real trouble now. That's still classified. I'd be very interested to know exactly how radioactive armadillos would be of any use on the modern battlefield, except to potentially make their handlers ill from radiation exposure. Oh, let me guess...that's why the program was terminated, right? Sheesh.